The search for the perfect hot chocolate has come to a screeching halt. 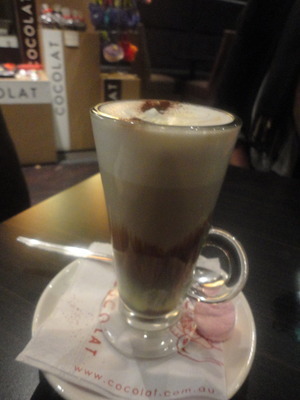 Enter Cocolat's Top Deck hot chocolate, and you would be hard pressed to find any other that can compete. And I would know, my mouth has had a long-standing relationship with chocolate, and they will not be separating any time soon. In the heart of the city lies the decadent walls of Cocolat Dessert Café, on the busy Rundle Street. From delicious crepes to sinful waffles, Cocolat offers everything in between, and the ambience to boot. If you are a chocolate lover, their wide selection of hand made chocolates are second to none. Maybe best to have a detox from any other chocolate before walking into Cocolat, to guarantee your taste buds an unadulterated experience. Their hot chocolate range includes white, milk and dark, and for the brave souls, there is a chilli hot chocolate to really wake you up. As the 2011 winner of Australia's best gelati for their Cocolat Rocher flavour, need I say more? Even the weather could not stop me from having a scoop of their scrumptious gelati; It goes down smoother than the oldest scotch. Good news to everyone who has not yet been infected by the sweet tooth-there are mouth-watering savoury options like the smoked salmon crepe, full of flavour and a great option for a light lunch. A great choice for a date, and they also bake cakes for special occasions, so if you can't bring the fun to Cocolat, Cocolat can bring the fun to you. Grab the girls this weekend, and settle on one of their cosy couches for a gossip session with every girl's best friend-Chocolate.